Here are some websites examples that use Income Activator's website builder and revenue streams. This website demonstrates the lead process. This is when you send 1 lead to 1 company at a time. You begin by contacting a company you want to send leads to, and agree on what a lead is worth. You may wish to start off at a $10 referral rate, and increase it as you get more companies wanting your leads. It's always best to send leads to companies providing services, like contractors, spas, chiropractors, dentists, lawyers, and so forth. When your visitor clicks on the submit button, they are directed to your referral company's website, which you can embed into your website so that your visitor isn't kicked off your site. The lead is then made, and your Income Activator program automatically creates your invoice. As you get more leads, they are automatically added to the invoice. A lead is never based on your referral company closing the business. It's only based on you directing your visitors to your referral company's website. 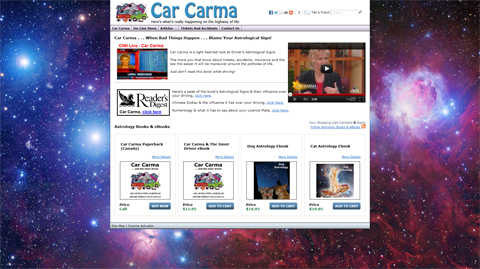 This website, Car Carma is a light hearted look at how your astrological signs affects your driving. It's eBooks were created through Income Activator's eBook templates. This website demonstrates how to make money through Directory Referrals. This is when you send 1 lead to MULTIPLE companies that all pay you. Here is an example to sending 1 lead to 10 painters. 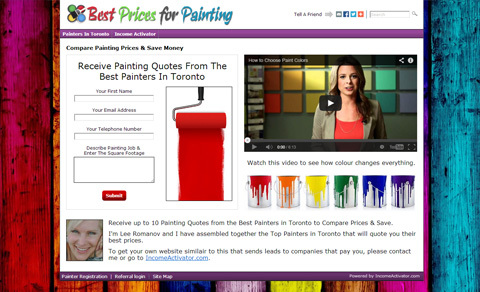 If each painter agreed to pay you $10 to quote on a painting job, the website owner would make $100 per lead. No one knows you're a dog when you're online. WhoLetTheDogIn.com has 10 Revenue streams. Here you can see how you can get paid from your own Pay Per Click links, and make money just like Google does. To do this you contact a company you want to send leads to, and agree on a pay per click rate. You can begin by suggesting $1 per click, and increase your rate as you get more companies wanting you to send then leads. In this example you, when you click on the Pet Insurance Company Links, it will take you to the referral company's website, that you can embed into your own website. The advantage of this is that your visitor isn't kicked off your site, like they are with other pay per click links. When your visitor clicks on the link, and is directed to your referral company's website, the click is tracked and your Income Activator website automatically creates your invoice.